Check out this beautiful used 82' Princess yacht for sale! : Atlantic Yacht & Ship, Inc. This beautiful used 82′ Princess Yacht for sale is proudly offered by Andrey Shestakov! As a matter of fact, this used 82′ Princess is simultaneously graceful and exhilarating. Moreover, her extended window line affords you exceptional visibility from the main deck. The expansive fly bridge cossets guests with soft sun pads, a teak dining table, and intimate seating. Likewise, a dedicated wet bar adds to the fun. Furthermore, her deep-V hull is poised to thrust you across the waves at an impressive 34 knots! After all, this used 82′ Princess is full of light and spacious. This is thanks to the extensive broad windows that run the entire length of the saloon. Inviting low seating gives a humble ambiance. Uniquely, there is a spacious formal dining area forward. And, when it’s time to retire for the evening, a full-beam master awaits you. This suite includes a large en suite bathroom and walk-in wardrobe. Additionally, for your guests, there are three beautifully appointed cabins, all with private bathrooms. 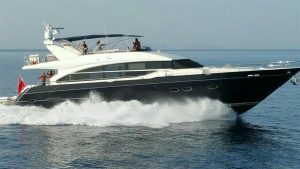 For more information on this sleek used 82′ Princess yacht be sure to contact Andrey Shestakov today!